1)Cut the drumsticks into 1 inch long pieces. 2)cut the Onion into lengthy thin pieces . 3)Heat oil in a thick bottom vessel(better to use a manchatty(claypot)). 5)Add the sliced onions and drumsticks and saute well. 6)Add the prawns and salt and mix properly. 7)Close with lid and allow to cook in a very slow flame. 8)In another heated vessel, fry the coconut along with the chilly powder on a slow flame till it turns dark in colour and dry. Allow to cool. 9)Grind this in a fried coconut make it into a thick paste and add to the vegetables and prawns mixture. 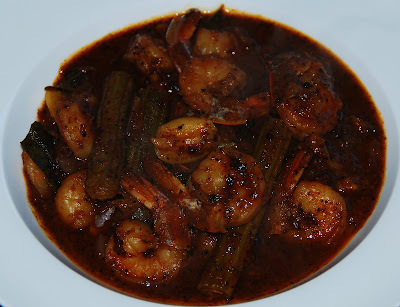 10)Add tamarind juice and curry leaves. Mix well. 11)Allow to cook for 10 mins.